Can I change Synapse shortcut to Super/Windows key alone? When I try to edit the synapse config it does not allow me to use the left Super as a shortcut to invoke it. Is there a round-about way that I can go through. When I just press the Windows/Super key the configuration window does not acknowledge it. However, a combination shortcut (such as Super+A) does work fine. Since I'm using Precise, with Unity, I'd also need a way to change the default dash behaviour for Windows/Super key to something else. See better answer below this one. You must bind the action to the Super's scancode or keycode; normal hotkeys record the state of the modifier keys and throw away their keypress events; so you never see something that reacts to just pressing Alt, but instead to the A key plus the Alt key's recorded state. The hotkey library in use is libgtkhotkey (0.2 on 12.04) and it doesn't support using the key press event from modifier's. You'd have to write your own patch to catch that and perhaps support such a thing in the signature format. All tests with the existing signature format failed to produce anything but an error. I know this is a little old now but thought solution by be useful anyway. 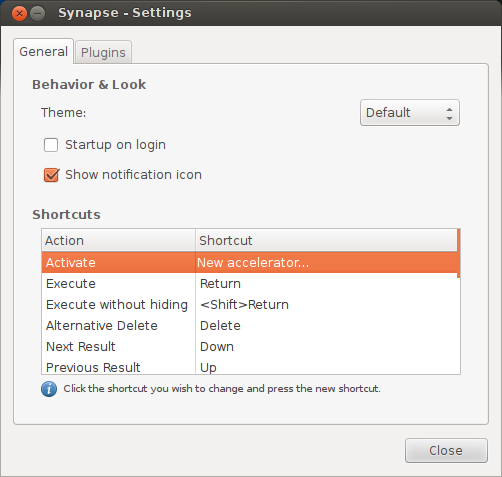 In later versions of synapse installed from the launchpad ppa the setting is in .config/synapse/config.json. Edit it while synapse is closed to specify Super_L as activation key. A temporary workaround is to remove the modifier from super and remap the key to a "normal key" you do not use. I choose "µ", which is named "mu". If you mess up while playing around with xmodmap, just log out and log back in again to restore your old settings. I've only tested with this one key, and I can still type µ by pressing Alt Gr + M without having Synapse pop up. I also tried remapping Super to Page Up; Synapse was able to detect the key while entering it in the settings, but failed to open the launcher when pressing it. Apparently ~/.config/synapse/ doesn't exist anymore. was enough to have synapse pop up with a single hit on the Super-key. add synapse then set its shortcut as super key. Not the answer you're looking for? Browse other questions tagged shortcut-keys synapse or ask your own question. Way to disable windows from resizing while dragging but allow keyboard shortcut resizing? How to change shortcut for Activities overview?